All children are placed in classes/levels by the teachers according to age as well as ability and experience. We understand that each and every child is different and that is why we give individual attention as well as group instruction in every class. No audition is required. (We feel children would not do their best in that stressful of a situation.) After placing children in a class, if we feel they would do better (whether physically, emotionally, etc.) in a different class we may move them after a few lessons. 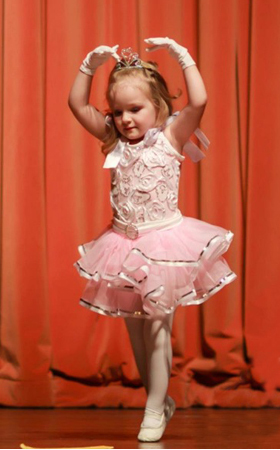 All recreational leveled classes combine ballet, tap and jazz into one class unless specified. Pre-Dance: (Ages 2 and young 3 year olds) – Our pre-dance classes introduces the children to movement and rhythmthough games, props, songs, and even their own imagination. This level not only begins enhancing their motor skills, movement vocabulary, body awareness, musical awareness, and much more, it also develops a healthy love for movement. Levels 1/2: (Ages 3 and 4 pre-school dance @ one hour per week) – Our preschool classes include the fundamentals to participate in future dance classes as well as begin school. They exercise with movement games and sing childrens’s songs. They are taught basic dance steps and the correct terminology and begin combination skills. These classes perform 2 dances at our annual recital at the Cannon Center. At Level 1, the students are introduced to skills. The Level 2 students master the skills and are prepared for the Level 3. Level 2.5: (one hour weekly) – By teacher approval, those 4 year olds that have naturally moved at a faster pace and mastered Level 1/2 will be recommended for this level. It is also the perfect fit for those young 5 year olds who may not be going to Kindergarten yet and have not taken dance classes previously. Level 3: (Five year olds who are beginning Kindergarten @ one hour per week)- This level builds on the preschool basics (A child does not need to have taken a preschool class to begin at this level.) with new skills and new steps introduced. These classes teach the building blocks of ballet, tap, and jazz, correct terminology and more complex combinations. Memory skills at this age allow for a faster learning pace than prechoolers. We still teach with a great deal of imagination and games to peak the children’s interest as well a trigger quicker comprehension. These classes perform 2 dances in our annual recital at the Cannon Center. Level 4: (Six year olds @ one hour per week) – At this level, the new skills previously introduced are mastered (new six year olds are taught these skills quickly). Terminology, as well as choreography begins to be remembered and embodied. How many of each step is executed and which leg to begin on is becoming more clear for the students during choreography. Two dances will be performed in our annual recital. Level 4.5: (one hour weekly) – By teacher approval, Six year olds who have mastered Levels 3/4 at a quicker pace than the normal will join this level. Two dances performed in our annual recital. Level 5: (7-8 year olds @ one hour per week) – Dancing more independently at this level, students incorporate more formations into choreography with two dances in our recital. Technique focus is increased in the classroom with a steep increase in volume of material. Performance skills along with upping the complexity of routines will be demonstrated at recital. Level 5.5: (7 year olds with significant experience and higher than average ability level @ 90 minutes weekly) – This level is very exciting, and where the children really begin to dance. They begin understanding the concepts of technique and learn more complicated combinations. They are taught performing skills and begin to learn some advanced dance steps. Progress at this level is great. This class performs 2 dances in our annual recital at the Cannon Center. Level 6: (combines ages 8-10. Eight year olds with experience, Ten year old beginners and Nine year olds that fall between the two @ 90 minutes weekly) – At this level, an additional class of Ballet Technique is offered, but not required (see below description of class). Ballet is still included with tap and jazz in the combo class. They will continue progressing in learning technique, new and more advanced steps, complex choreography and performing skills. This level also performs two routines in our annual recital. Level 7: (Ages 11-18 Jazz (@ 60 minutes weekly) and/or Tap (@ 45 minutes weekly))- This is the level for dancers who wish to continue their dancing at a recreational level and not increase their commitment time. It is also perfect for dancers who do not have significant experience in dance or have taken a break and want to return to the dance studio. It is ideal for theatre kids who need some dance to round out their talents for musicals. They will be performing once per style (jazz/tap) in our annual recital. Tumbling/Acro: We have several levels in our tumbling program. The first three are 45 minute classes for ages 4-7, 5-8 and 6-10. Overlapping ages are divided by experience/ability. We also offer two levels of one hour Acro classes for ages 11-18 specifically designed for advanced dancers, but teen non-dancers who are interested may join us as well. These classes are for floor work gymnastics and acrobatics to supplement students’ dance training or to stand alone. Kids Hop: For ages 6-9, this 45 minute weekly class will be the young dancer’s introduction into the street style of hip hop. Age appropriate music and movements will be a priority at this level. Hip Hop: For ages 9-18 (divided into two levels). These classes incorporate popular, current dance moves with age appropriate music. Emphasizing fun and athleticism, students will learn styling, improvisation skills, choreography and improve coordination. Pre-Company: (Ages 8-11, by teacher placement only. 1 1/2 hours jazz/tap plus 1 hour of ballet technique required per week)- This level is our first “non-recreational” level. Commitment to the class and and students’ dance training is asked for. However, we still foster a love of dance and encourage the students. We are never harsh. Students may be recommended for this level after completing Level 5.5 or Level 6 depending on the individual. These classes begin to more into more complicated combinations as well as advanced steps. Flexibility, strength, endurance, and dedication begin to factor in to these developmental years. This class is invited to several extra activities throughout the year (see company activities). This class performs three dances at the annual recital including performing in all three performances of the company ballet in our annual recital at the Cannon Center. Ballet Technique Classes: (ages 8 and up 1 hour per week , in addition to the regular combination classes, these classes are required of pre-company and company members and optional for other dancers. Current levels include Ballet I, Ballet II, Ballet III, Advanced Ballet Technique and Senior Company Ballet. Advancement to the next level is not automatic in one year) -These classes study alignment, rotation, and the technique aspect of ballet. They are much more in depth than combination classes. More advanced steps and combinations are included. Ballet is the building block of all dance and these classes bridge the gap between the intermediate and advanced dancer. These classes do not perform any extra dances in the recital. Pointe Classes: (1 hour per week. By permission of instructor after a minimum of 1 year of Ballet Technique III or equivalent at other studios. Current levels include Pointe I, Pointe II, & Pointe III)- Advanced ballet dancers learn to dance en pointe (on the toes). Repetition strengthens the foot and ankle muscles until the beginner pointe dancer is strong enough to leave the barre. The dancer must “start over” in her training when begining pointe classes and learn to stand up, progressing from there. The intermediate and advanced dancers continue to strengthen their bodies and train, transitioning the steps and techniques from soft shoes to pointe. These classes will perform on pointe in the company ballet. Private Classes: (Co-requisite of participating in competition groups or company production number) – To sign up for private dances, you will sign up for weekly 30 min. time slots for each dance for a total of eight lessons. These classes will be in the fall. Second semester, you will sign up again for a 30 min. time slot to continue fine tuning your dance. You may share this time slot and split the cost. The 8 lessons will be consecutive weeks. If absent, no make up lesson is available. Please be courteous and call if you aren’t coming. If the teacher cancels, the lesson will be made up. Practice is expected between lessons so that the material is remembered. If more than 8 lessons are needed due to failure to attend, remember, etc. a charge will apply. After your music has been cut to the performance length, you will receive a practice CD. To perform a solo,duet, or trio in the recital, you must be a company member. Mini Competition Group 3 may perform a competition group dance in the recital (see Company & Competition Info./Competition Groups). Only one extra dance is allowed in one recital (except student teachers that have been certified by SADM who may perform an additional piece). If you do not meet these requirements or wish to do more or wish to do a student choreography piece, you may do these dances for competition. Mrs. Tracy will decide which dance is done in which recital. If you have never done one, a competition group is recommended first, followed by a duet or trio.